Here is one of my favorite politicians to make fun of, Michele Bachmann. I did miss her when she pulled out of the presidential election, but Romney filled in rather nicely. 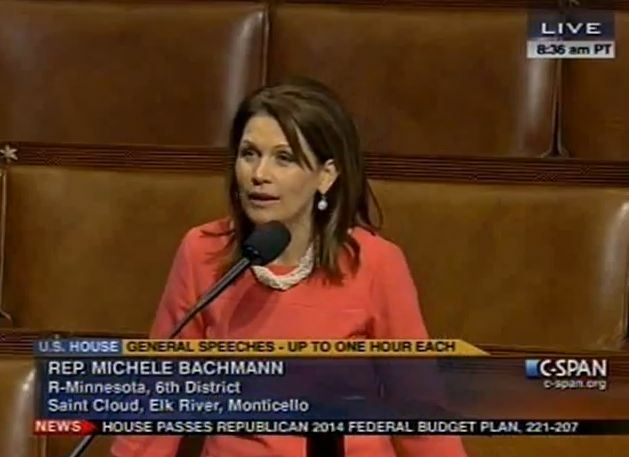 Here is Bachmann being ever so melodramatic about Obamacare. And completely wrong (of course). She has her facts backwards… again. Our healthcare was killing women, children and old people BEFORE the Affordable Health Care Act was instituted. I’m not going to sit here and preach that Obamacare is perfect, because it isn’t. But it’s one helluva start. It took some mighty elephant-sized units to push this forward against all the Oligarchs, but it worked. Now the House, led by Boehner himself, keeps wasting our tax dollars and their precious time – since they take so many vacations – in attempting to repeal the Act that Obama would have to sign off on if passed by both the House and Senate. Boehner is runner-up for the same Emmy Category. Westboro Baptist Church has a new neighbor. A Rainbow House! The scariest thing about Bachmann is what it says about the majority of voters in Minnesota. Ha! No kidding! That MinusIQ is great! That’s (sadly) so true. Thanks for commenting! Hope to see you again! I wonder if she even believes what she says. After attacking the President’s so called lavish lifestyle, she went running down the hall when a reporter tried to question her about it. I would think that of she believed her own statements, she’d be happy to talk about them and be able to back them up. It astounds me this woman is on the intelligence commitee. PS Love the minus IQ pill, it must be what they’re passing around in the Senate washrooms. Yeah, that MinusIQ is great! Now, when it comes to the perks of Presidency, I’ve always defended their lifestyle. Even when it’s a lowlife like Bush in office. I mean, my gawd, they’re President of one of the most powerful countries in the world! They deserve lavish toilet paper as far as I’m concerned. And the protection? Especially that, and especially Obama. He receives multiple death threats every… single… day! My tax dollars go towards taking care of our president, and I am just fine with it. I offer this axiom…The less we provide this lunatic with publicity, the less of a platform she has to espouse her lunacy. What is wrong with this country? Why do we provide the crazies with an opportunity to attract media attention to their rantings? All that does is encourage more disgruntled lunatics to have a voice in our national thinking. They shouldn’t. They contribute absolutely nothing. It’s time to stop allowing the likes of Bachmann a platform and to ignore her senseless, hateful rantings. This done, she, and her mindless minions will soon be relegated to cells in various Bedlams for the insane where they justly belong…instead of giving them voice in the Bedlam of Congress. I liked her better before she was kicked out of Bachmann, Turner Overdrive. 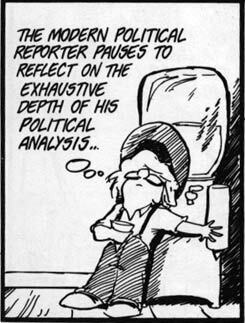 I’m like this with Rush Limbaugh. I have a couple posts about Rush, but they’re not about his rants. I refuse to give him any time and any publicity because that is exactly what he wants. I agree with an earlier comment in which Pied Type worried about the people of Minnesota who elected Bachmann into office. Making fun of her is thus giving her the power to gain more votes among an activated fringe that we have empowered into becoming a majority, at least in Minnesota. The less said about her the much better. To borrow a quote from Forrest Gump’s mama, “Stupid is as stupid does.” The writer of that book must have had Ms. Bachmann in mind when he wrote those lines.